We meet under the Full Moon, dancing the ring as the light pours down, raising power, sending energy, feet pounding the earth. What do we need from the Goddess? Who is She? The dance is part magick, part prayer and part ecstasy. 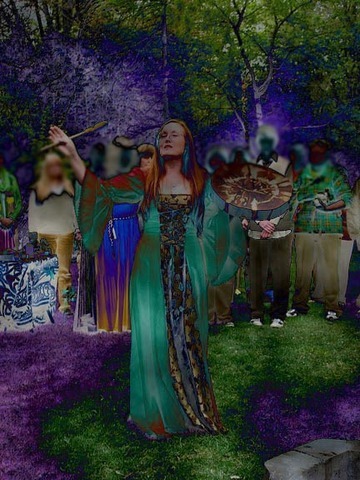 As we perform our ritual within the Circle we create energy that is palpable. It rolls up our bodies and makes us shiver. As the dance continues we fall into trance as all the Witches are energetically one, hearts pounding, until a feeling of joy overwhelms us. That is the time that the High Priestess motions for us to release the energy upward and outward, focused and pure toward the completion of the spell/prayer/dance. When we started the ceremony we invited the Goddess to be with us in the Moonlight. Each Coven or Tradition, even each person, has different Patron Goddesses that they know and love. Ours is Anu, the timeless one, the Great Mother of the Celts, also called Danu. When we first met her she seemed distant and obscured by the mist and we couldn’t get a clear image of who she was. In our meditations and Circles Her presence continued to be felt more and more strongly each time we invoked her and she became our Mother Goddess. Her face became clear in our minds, a sweet mature face of a woman of child-bearing age, kind eyes glowing with love and wisdom. We felt nurtured. Beginners in the mystical and transformative spiritual path of Wicca are drawn to the divine as feminine, often researching the Goddess in books and on the internet. This is a good first step, but the Goddess is the spirit within nature so to truly know Her, in all Her aspects she has to be invited in. This “inviting in” is a process of opening the heart, calling, longing and searching. It doesn’t happen overnight. Seeing Her in a specific aspect with a story and a name helps the process. Without this study it feels as if we are worshiping a nameless, faceless goddess and that can be difficult. Worship involves loving and it’s difficult to love a non-person with no face who is just a feeling in the bones. Luckily for us the Goddess has many names and faces so we move towards the goddess that resonates with us. It’s impossible to say if the Celts worshiped Anu as we do because they were an oral-wisdom people. Their bards held the stories of the tribes in their memories and things were not written down until the Romans came to the British Isles. Although re-constructionism, the honouring of Anu or Danu has profoundly touched many within the Neo-Pagan traditions. Her worship within some secret place, and in the secret place that is our inner heart, has brought Her back to us. She is alive and vital and present. Altar: Anu’s altar should be green with plants and stones on it. Lay a green altar cloth and place a bowl of earth with a bowl of water in it. If you can find a picture that reminds you of Her, the Great Mother, you can also put that on the altar, maybe ringed with stones. Potted plants are also good, but don’t put cut flowers, which are dying, on this altar. Let your inspiration guide you. And fill us with the power of your love. Opening the heart: Imagine your heart center opening like a ball of pink light that grows bigger and brighter as you breathe gently in and out. Now invite Anu to enter your heart shrine and bless you. Chanting her name: “Anu” can be chanted like “Om”; take a big breathe and intone “Ah-Noo”. You’ll be surprised how it changes your consciousness. Offerings: Make offerings of fruit, nuts, honey, cakes or any food that is natural and organic. Don’t offer store-bought chemical-filled food as an offering. Making an offering to the Gods is a way of honouring Them. Drawing and writing: Make sure that you write down any experiences you have while working with Anu. How did you feel? Did you have an inspiration about who She is? Can you draw Her face?